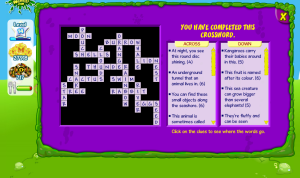 The Binweevils the Great Outdoors crossword answers are here so you can complete the puzzle. This puzzle is the third Binweevils crossword in the game. Click the link below to get all the answers to the Great Outdoors crossword puzzle. When you complete this crossword you will get free XP which helps you level up your Weevil. If you are stuck on a question and don’t know the answer don’t worry. We have all the answers to all the puzzles. We are here to help you complete all of them. The Binweevils The Great Outdoors crossword tests your knowledge of how much you actually know about the outdoors. Our team likes to think that we know a lot about the outdoors but even this puzzle gave us some troubles. Click here for the Binewevils The Great Outdoors Crossword answers. This will take you to the main answers page where it is nicely laid out for you in text. The picture also has the answers to it but i doubt you can see because it is to small. I hope you enjoy using these answers and can complete all the crossword puzzles from our help. Leave a comment and let us know if this helped you.